Recent years have seen the development of a number of applications of fluid dynamics and hydraulic principles in stream ecology. Recent books by Gordon et al. (2004) and Vogel (1994) provide excellent treatments of fluid mechanics for biologists. 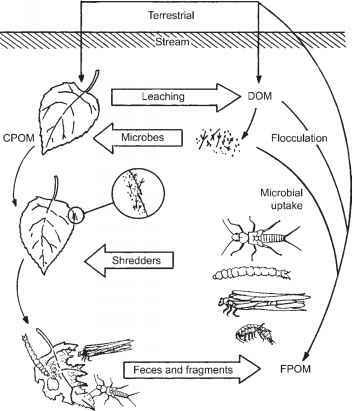 Reviews by Davis and Barmuta (1989), Carling (1992), and Hart and Finelli (1999) are especially useful from the perspective of life on the streambed. Webb (1994) reviews the biomechanics of fish swimming movements. Application of these ideas often requires measurements of current velocity at finer spatial and temporal scales than was previously the norm, resulting in various efforts to better characterize the flow conditions experienced by organisms. This continues to be a challenge, as many methods are too expensive or delicate for easy field use, and some obtain measurements at a coarser scale than is desirable, or are invasive, potentially disturbing the flow microenvironment they intend to measure. While perhaps none is perfect, several approaches in wide use are worthy of description. The FST-hemisphere method (Statnzer and Muller 1989) consists of 24 hemispheres of identical size (7.8 cm) and surface texture but different densities exposed sequentially to current on a weighted Plexiglas plate. The heaviest hemisphere that the current is able to displace is an indication of near-bed hydraulic forces, and calibrations to near-bed velocity and shear stress are obtained from near-bed velocity profiles or hydraulic simulations. The plate is placed at locations of interest on the streambed, such as where benthic invertebrates have been collected. It is not a direct measurement, introduction of the apparatus may distort local flow, and the scale is large relative to the organism. Methods allowing direct measurement in some field settings at scales approaching that of benthic macroinverte-brates include hot film anemometers (HFA) and acoustic Doppler velocimeters (ADV). However, HFA is both expensive and fragile, limiting its usefulness in the field. ADVs are gaining interest because they allow three-dimensional, fine-scale velocity measurements in field settings and thus estimation of shear stress and turbulence. The Doppler shift between transmitted and received signals from suspended particles is used to calculate velocity. Nikora et al. (1998) used an ADV to examine how the presence of the aquatic moss Fissidens rigidulus on cobbles influenced near-bed flow environment in a stream flume by measuring flow around cobbles with moss, and then repeated the measurements after removing the moss without disturbing the cobbles' position. Velocities in the upper layer followed the standard logarithmic profile, but within the lower sublayer the interaction of flow with roughness due to moss had a marked effect, with reductions in velocity, stress measures, and turbulence (Figure 5.4). Another approach that appears to hold promise for fieldwork uses tubes of very small diameter (syringe needles) to measure pressure differences in the boundary layer (Ackerman and Hoover 2001).